Jennifer Lawrence in Dior - winner in a category Best Actress for "Silver Linings Playbook"
The 2013 awards season has officially begun with the 70th annual Golden Globes ceremony in Los Angeles. More relaxed than the Oscars but with more couture than, say, the VMAs, the Golden Globe awards, presented to the best in TV and film, are our favorite chance to check out our favorite stars wearing some unforgettable frocks. This year it may have been unusually chilly on the ruby rug, only 12 degrees, but the fashion was certainly hot. Check below the best and the worst dresses and the list of winners. Con la 70ta ceremonia anual de los Globos de Oro en Los Angeles comenzo oficialmente la temporada de premios en 2013. Más relajados que los Oscar, pero con más alta costura que, por ejemplo, los Video Music Awards, los Globos de Oro, que presentan a lo mejor de televisión y cine, son nuestra oportunidad para ver nuestras estrellas favoritas llevando unos vestidos inolvidables. Toca decir que aunque este año hacia mucho frío en la alfombra rojo, solo hacia 12 grados!, la moda sin duda estaba caliente. Os dejo a continuación las mejores y peores vestidas y la lista de los ganadores. 70 ceremonia Złotych Globów w Los Angeles rozpocząła oficjalnie sezon nagród filmowych. Bardziej wyluzowane niż Oscary, ale o wyzszym poziomie mody niż, powiedzmy, VMA, Golden Globe Awards, nagradzajace najlepszych w branzy telewizjnej i filmowej, są nasza szansa na obejrzenie ulubionych gwiazd w niezapomnianych kreacjach. W tym roku chociaz bylo wyjątkowo chłodno na czerwonym dywanie, tylko 12 stopni, moda z pewnością byla gorąca. Poniżej mozecie zobaczyc najlepiej i najgorzej ubrane oraz liste nagrodzonych. Anne Hathaway in Chanel Haute Couture - winner in a category Best Supporting Actress for "Les Miserables"
Jessica Chastain in Calvin Klein Collection - winner in a category of Best Actress in a Motion Picture for "Zero Dark Thirty"
Reinhold Heil & Johnny Klimek, "Cloud Atlas"
For You, "Act of Valor"
Not Running Anymore, "Stand Up Guys"
Safe and Sound, "The Hunger Games"
I am so glad that Anne Hathaway won the Best Supporting Actress award. She was outstanding in Les Mis! And of course, she looked gorgeous as always. I also really liked Jennifer Lawrence's look. It's different from her usual. I am so glad Anne Hathaway won Best Supporting Actress. She was outstanding in Les Mis! She also look so gorgeous, as always. I also really liked Jennifer Lawrence's dress. It's different from her usual look. really like jessica alba and miranda kerr! completely agreed :) and this has been enjoyable to read! I love Lucy Lu - that was a gorgeous gown! Me ha encantado el vestido de Taylor Swift! Maravillosos vestidos!!! mis preferidos: Anne Hathaway, Heidi Klum y Halle Berry!!! I love them all,but my fav is Jennifer Lopez! Mis favoritas son Anne Hathaway, Kate Hudson y Zooey Deschanel sin duda! I agree with your picks, my fave has to be Amy Adams look, she is perfect. And I'm happy that Argo won!!! I never follow these award shows and what celebrities wear, but I've been seeing Anne Hathaway's picture around , and my god is she gorgeous. She embodies the epitome of elegant chic in that marvellous Chanel HC dress and her haircut. She reminds me of an elegant mod girl haha. She is the best dressed for me. glad she won the award. All ladies are so fabulous. I cannot pick one! I love the look of Anna Hathaway! There are so many wondeful dresses! I really love how Miranda Kerr, Isla Fisher and Julianne Hough look! Hola guapisima!! creo que como siempre algunas aciertan más que otras pero creo que Miranda Kerr siempr, siempre va estupenda y acierta siempre!!! Besotes!!! Thank you for visiting my blog and sure we can follow each other! Thanks and love the blog! Great job! Anne Hathaway estaba estupenda! También nos gustó mucho el Zac Posen de Naomi Watts, el maravilloso Oscar de la Renta de Zoey Deschanel y Mayim Bialik nos sorprendio muy muy muy gratamente! Hemos llegado aquí por casualidad y nos encanta tu blog. Pásate por nuestro blog y, si te gusta nos seguimos. Wow! I havent been able to spot all these dresses at once. Thanks for sharing! My favorite is Miranda Kerr. omg love love and love. this post is full of amazing dresses and beautiful ladies! and jessica alba will forever be my favourite - she's about the closest to perfect (her body ;p). nigdzie nie udało mi się znaleźć wszystkich gwiazd czerwonego dywanu podczas Globów więc fajnie przeglądało się te zdjęcia. bardzo fajny post. El vestigial de Pronovias es mi favorito! love your post!there's everything in it!amazing! Me encanta la recopilación que has hecho, yo no pude verlos así que me encanta! Wow these are fabulous!! I find all your knowledge on this fascinating. I would have ti say my favorite is Jessica Alba in Oscar de la Renta gown- which I see is the winner anyways:) Great blog! Love the color of Jessica Alba's dress! I love all the white gowns - but everyone just looks gorgeous! great post! most of the dresses are amazing! there were so many great dresses! i loved kate hudson's and michelle dockery was a stunner, too! Me gusta mucho Anne Hathaway! besos! I love the looks of Jessica Alba,Maria Menounos and Miranda Kerr! Love all the sparkly and glitter dresses! Everyone looks so gorgeous! Thanks for visiting my blog and suggesting we follow each other! I'm your newest follower :) I look forward to you following back! I love so much Julianne Moore, Emily Blunt and Kae Hudson <3 so glam everybody! www.the-world-c.blogspotcom + JOIN MY GIVEAWAY you can win a fab dress! love looking at all the pretty dresses! 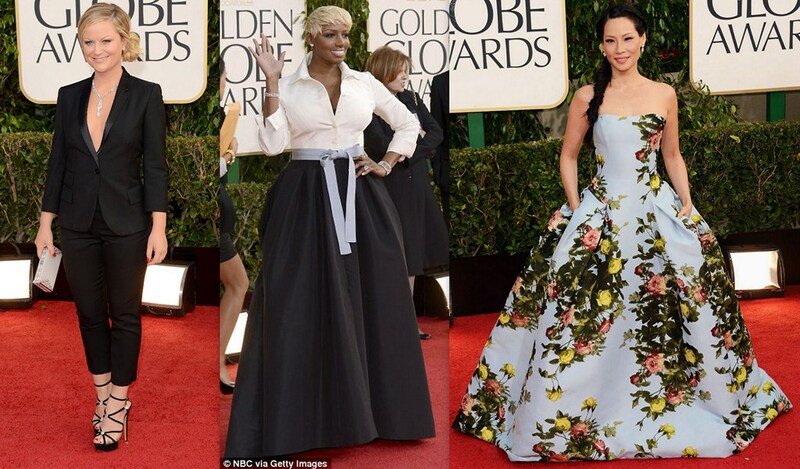 I love how you organized the gorge dresses by color - thanks for the thorough Golden Globes recap! Kate Hudson and Katherine Mcphee both looked stunning. Great post! Following you on Bloglovin now, would love for you to follow me back. Rachel Weisz is a dream!!!! I like Jessica Alba´s dress the most + Julianne Hough in Monique Lhuillier´s dress. Thank you Aga so much for this post! It´s increadibly helpufl! I really agree with you about Jennifer Lawrence in Dior! She looked gorgeous!